Time flies when you’re having fun as a homestead turkey farmer! It seems like it was just yesterday that we went to the post office to retrieve our 25 turkey poults! So much has happened over these last nine weeks though. I’m so glad we decided to try our hand at turkeys this year. Before the babies arrived at the homestead, we went to our favorite feed mill and purchased 600 pounds of 26% turkey feed. I thought it’d last, expecting to mix some lower protein feed into it when the birds hit 8 weeks of age, but nope! 600 pounds was enough feed to get 43 birds (24 turkeys, 9 guineas, and 10 chickens) to the 9 week mark, so that meant another trip to the mill. Yesterday, we snagged 550 pounds of a lower protein ration, and I’m guessing we’ll have to go back in another three weeks. Hopefully, we’ll be able to take the trailer then so we aren’t limited by the weight that we’re willing to put in the passenger compartment. I’ve learned so much over the past nine weeks. I’ve learned that I love the sound that turkeys make. I’ve also learned that turkeys are harder on the ground than I expected, and they’re DIRTY! I don’t understand that part since a lot of them like to sleep in the front of the pen so they can get rained on..
And lastly, I’ve learned that our brooder success this time around meant that I need either larger pens or fewer birds. Everyone kept saying, “Turkeys are stupid. You’ll have losses.” We lost one out of 25 birds, and we have no idea what happened. At around five or so weeks, we came out to the pen for chores and we found a dead bird with no indications as to how it died. Everyone else has thrived though, so now I’m having to think about how I can free up pen space. I realize that I still have seven to eleven weeks until graduation day, and I still have so much to learn, but halfway through, things seem pretty promising. And as an interesting aside, I’m really loving the guineas that we’ve raised with the turkeys. I haven’t decided when we’ll turn them loose yet, but I’m sure that time will be sooner rather than later. 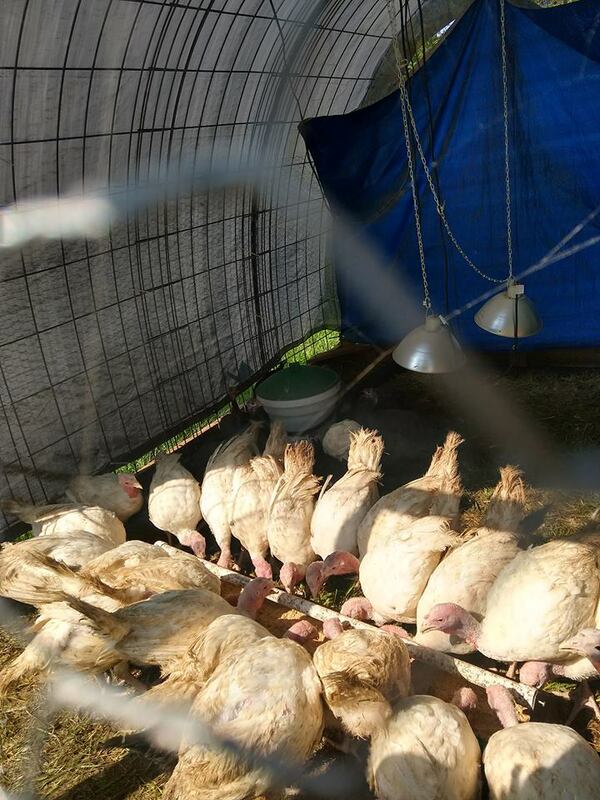 This entry was posted in Blogs, Homesteading and tagged turkeys. Bookmark the permalink.